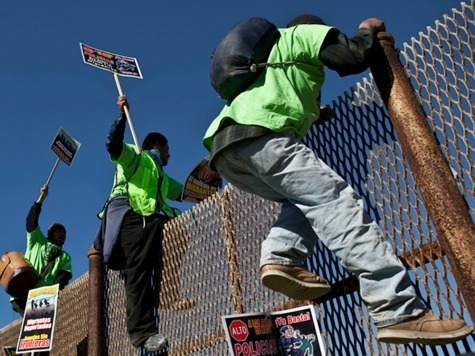 Several black leaders of various political persuasions have banded together to warn Congress of the harm they think the “Gang of Eight” immigration bill will inflict upon black workers if passed. The group, the Black American Leadership Alliance, wrote to members of the Gang of Eight, the Congressional Black Caucus, and members from states with the highest levels of black unemployment. Perhaps more significant than the argument being made is the political diversity of the letter’s signers. These facts have been presented to members of Congress before by select members of the U.S. Commission on Civil Rights, but those efforts did not result in changes to the immigration reform bill. Now, there are at least some black community leaders who represent the political left who have signed onto this argument–a new development that may help connect with Democrats in Congress. T. Willard Fair, the President and CEO of the Urban League of Greater Miami, signed the letter. Though Fair is a Republican, President Obama appointed him in 2010 and 2011 to the President’s Commission on White House Fellowships-Miami Regional Selection Panel. Former U.S. Department of Justice immigration attorney and current executive director of liberal group Progressives for Immigration Reform, Leah V. Durant, signed the letter as well. Frank Morris, PhD, a board member of Progressives for Immigration Reform and the former executive director of the Congressional Black Caucus Foundation, put his signature on the letter as well. Conservative signers include Brotherhood Organization of a New Destiny (BOND) founder and president Rev. Jesse Lee Peterson and radio host and The Black Sphere executive director Kevin Jackson.